An elegant, sliding phone, the Siemens SL65 is an enhancement of the classic SL55 handset, featuring a larger screen, digital camera and several enhancements to make the SL65 a much more practical and versatile phone. The screen on the Siemens SL65 is a 130x130 pixel unit in 65,000 colours. Added to this is a VGA-resolution camera, built-in speakerphone, upgraded WAP browser and software, Java support for games and much more. 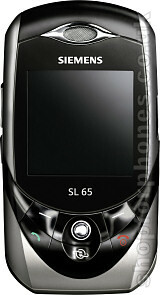 The SL65 is a tri-band GSM phone supporting GPRS and measures 90x48x21 mm, weighing 99 grams. Talktime is about 4.5 hours with up to 10 days standby time. Available now on O2 and Vodafone Contract or SIM Free for UK or Worldwide delivery. Subscribe to our newsletter for updates on other networks and Pay-As-You-Go. If you want more information on the Siemens SL65, subscribe to our mailing list. Also, the Update newsletter contains general news about new phone releases.